As time flies past and yet another school year draws to a close I realised that I don't update often enough on the progress of Thing 1-5. As my eldest turned 17 in May he has now started his driving lessons. It's so scary to think that I have a child who is learning to drive yet I still have a toddler who is so dependent on me still plus all the others in between and all at different stages of growing up. Thing 4 finished nursery last week and has started enjoying his Summer Holidays before he starts Reception class in September. He progressed extremely well through nursery and has really grown into a fun loving, chatty little man who is really good with numbers and loved his French lessons at nursery too. Learning the French words for colours, greetings, animals and pets. He is obsessed with Lego, recently taking 2 trips to Legoland with his grandparents and Daddy and really getting stuck in on all of the rides. I am sure we will be making another trip again soon over the Summer break. 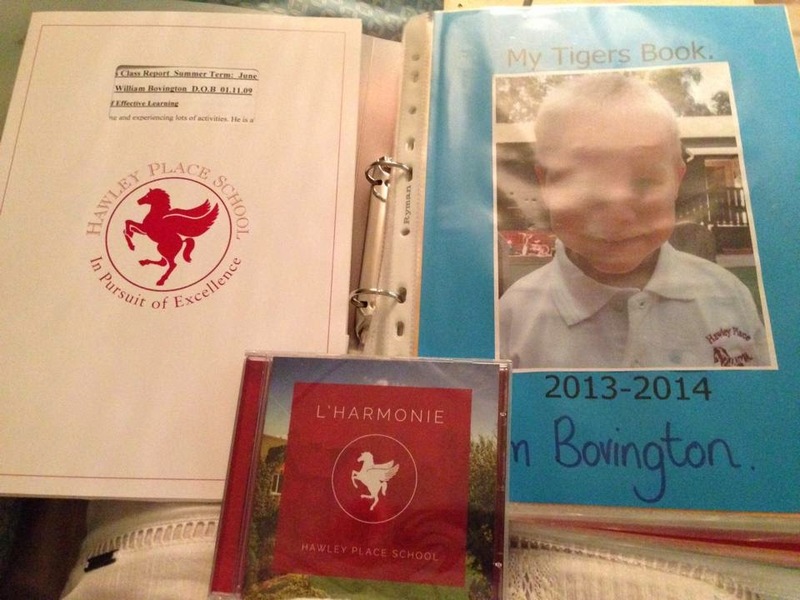 Thing 4's school report, folder of work and a CD made by all of the children at the school. Thing 2 is also finishing at Junior School tomorrow and is progressing to our local Senior School in September. After 3 days of visits a couple of weeks ago which she really enjoyed I think she is now looking forward to starting and getting stuck into the different learning environment that she will be in for the next five years. Last week she went on a residential trip with the rest of her Year 6 class to Burley and had a fab time all week. Last night she also had her Leavers Disco at school, lots of girls were in tears and I'm sure there will be more tears tomorrow, such an emotional time. This means two new sets of uniforms to be purchased over the Summer Holidays including new school bags, lunch boxes, stationary, footwear and everything else that goes with it! I must remember to label everything as always and make sure they are well prepared before the first day and not leave it until the last minute. Thing 3 has plodded along through Year 3 nicely this year. Even with a change of 5 teachers in her first year at the school, which can't have been easy for any of the children, she came away with a wonderfully pleasing end of school report as did Thing 2 and Thing 4 with their end of year reports. So as they all grow up we have just reached the transition stage where Thing 5 ditches the cot and moves into his big boys bed. This really is Goodbye to the cot now as it will no longer be making an appearance in this house and reality that all of the babies are slowly growing up has hit home. We chose the new Ikea Busunge extendable bed for Thing 5. I had seen it after I realised that the Mammut range which I was going to opt for had been discontinued and after a quick Google I found some information on the new Busunge range and I liked the look of it. At the moment it is only slightly bigger than his cot was and it will extend as he grows into a full size bed. It is a lovely blue colour and the Busunge range also has a matching wardrobe and drawers. We took a trip to Ikea Southampton on Sunday and I was pleased to be able to drop Thing 3 and 4 off in the Smaland play area for an hour whilst we had a look around. This was the first time I had use the facilities there and I will definitely be doing it again. They are well looked after by trained play professionals and it gave us a little bit of piece, we still had Thing 2 and 5 with us! The main reason we went was to purchase the bed but as always we picked up a few little bits and pieces too. 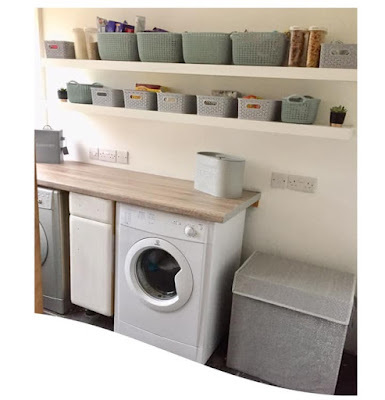 We also had to buy the Vyssa Slappna extendable mattress to use with the bed and I also bought the Drakdjur bedding set and Bullrig rug as both caught my eye as we were browsing the Children's Ikea section. OH assembled the bed in about 45 minutes yesterday evening and it seemed quite easy with easy to follow instructions. It looks lovely and it's fab that for now we can keep it small whilst Thing 5 is still small but then we have the option for the bed to grow with him. The Busunge range wardrobe and drawers have made an appearance on the website but the bed is yet to be added. You may find that you can ring your local store to check stock of the bed. We took a chance in driving to Ikea before checking. They had a pink one on display which was out of stock but they had 4 blue ones left after I enquired. Last nights first attempt at sleeping in his big boys bed didn't go quite to plan but it's all new to him and as time goes on he should settle well into his new surroundings. 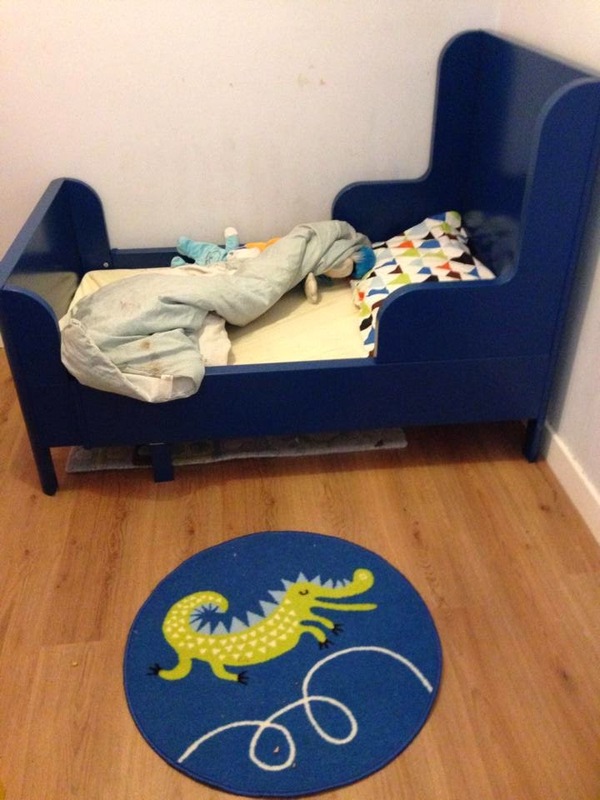 The finished Ikea Busunge bed, we are yet to use our Drakdjur bedding as Thing 5 won't give up his beloved (and very slightly shabby!) cot duvet just yet. As they all grow up so fast we look forward to many more adventures with our brood and saying Goodbye to the baby years, onwards and upwards!